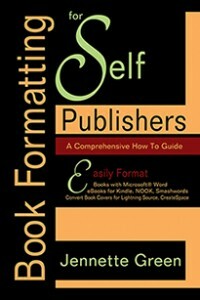 It is my great hope that Book Formatting for Self-Publishers, A Comprehensive How-To Guide has been of benefit to you. I remember how overwhelmed I felt when I first started out in the publishing field several years ago. All of the new technical details of publishing seemed unending. As well, it took quite a bit of trial and error to learn how to produce files that work well for the different print and ebook formats. My hope is that this book will help you learn the process in a much faster way, using simple, step-by-step instructions. You’ve learned that you really can produce a professionally formatted book by using Microsoft Word and Adobe Acrobat. Even better, you can compete on a level playing field with the publishing giants at online retail outlets, such as Amazon.com. The possibilities are limitless, with a great book and a well thought out marketing plan. If you’ve found this book helpful, please consider writing a positive review on Amazon—it would be very much appreciated! It also will help others find this book. If you have questions, comments, or if you find broken links, please visit the new Help Forum at www.formatabook.com, and let us know. It is my goal to keep this book current, and its information as complete as possible. The stigma of self-publishing is vanishing. Now is the time for talented authors and publishers to make their mark in this fast-changing industry. I wish you the very best, and many, many book sales! Questions? Visit our contact page at Diamond Press.